If A Tyranny of Petticoats doesn't grab your attention by virtue of the title alone, then let me add that it is a new anthology of YA short stories that aims to highlight and celebrate girls in American history. And it's edited by Jessica Spotswood, whose Cahill Witch Chronicles trilogy I adored (Born Wicked review here). Contributors include Kekla Magoon, Beth Revis, Katherine Longshore, Y.S. Lee, Marie Lu, J. Anderson Coates, Lindsay Smith, Robin Talley, Leslye Walton, Caroline Richmond, Andrea Cremer, Marissa Meyer, Elizabeth Wein, and Saundra Mitchell! This anthology cleverly arranges the short stories chronologically according to setting, so the stories span the early eighteenth century through the late twentieth century, from the British controlled seas near the shores of America to the far reaches of Alaska. The social, racial, cultural, and political diversity of these stories is refreshing and impressive. Anthologies can be a tough sell because they vary widely in many ways, but that's what makes this anthology so appealing. I personally preferred the stories that stuck to realistic settings and premises, or whose magical elements corresponded with the specific culture or beliefs that the writer was exploring. But I was so impressed with how these authors imagined their characters alongside actual historical figures and specific events to give readers a new perspective on history. My favorite stories were "El Destinos" by Leslye Walton, "Pearls" by Beth Revis, "The Legendary Garrett Girls" by Y.S. Lee, "Bonnie and Clyde" by Saundra Mitchell, and "The Pulse of the Panthers" by Kekla Magoon, but the fact is that I enjoyed this entire anthology so much. It's definitely worth purchasing and reading in chronological order, but I'm sure I'll return to so many of these stories (out of order) again and again. 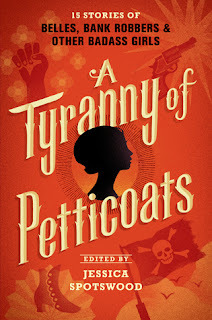 A Tyranny of Petticoats will be out on March 8th! ARC provided by publisher. Harry Potter and the Cursed Child!